Sir William Howe, shown in a 1780 engraving, served as commander in chief of the British Army in America from 1775 to 1778. Howe was responsible for the campaign to capture Philadelphia, having already captured New York in 1776. He successfully took Philadelphia in September 1777 and led the bombardment of Fort Mifflin and Fort Mercer later that year to open a supply line to the occupied city. 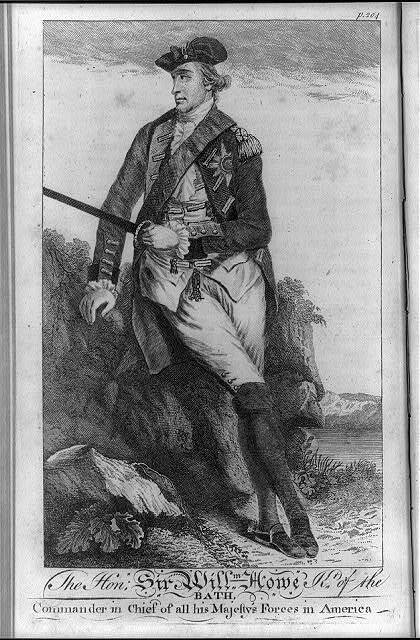 Though Howe was successful in capturing Philadelphia, he did not aid in General John Burgoyne's invasion from Canada. Burgoyne was forced to surrender, and this victory for the Continental Army is considered a principal reason that France joined the war. Howe's other missteps, including a near-loss in the Battle of Germantown and his failure to control looting by the British Army in Philadelphia, further exposed his weakness. He resigned from his position in May 1778, a month before the British evacuated the city. 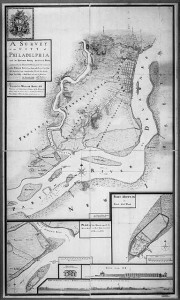 This map by Pierre Nicole for the British shows the fortifications surrounding the city of Philadelphia during the American Revolution. 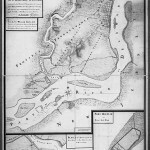 Inset is Fort Mifflin, located on Mud Island (lower left), which was bombarded for about six weeks in the fall of 1777. Philadelphia is located in the top right of the map. British Navy ships traveled up the Delaware River from Head of Elk, Maryland, to invade the city during the Philadelphia campaign. 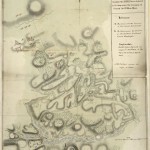 Though unable to prevent the British from capturing Philadelphia, these forts for a time stymied efforts to supply the occupied city by successfully frustrating British efforts to bypass or destroy them. 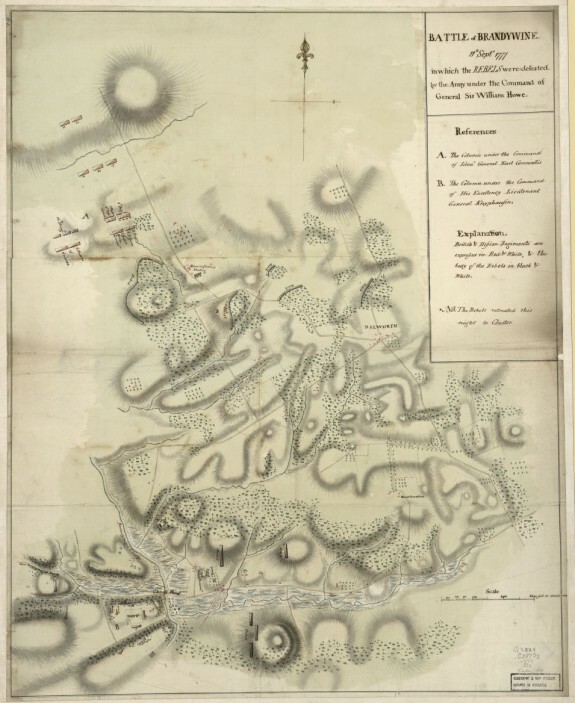 This 1777 British map's legend gloats, “The Battle of Brandywine, 11th September 1777, in which the REBELS were defeated.” It shows the battlefield at Brandywine Creek, near Chadd's Ford, Delaware County. George Washington believed he had cut off or fortified all other crossings of the Brandywine Creek and the approaching British would be forced to cross at Chadd's Ford. 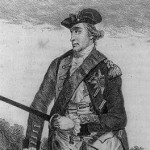 British General Sir William Howe was more familiar with the land, however, and ambushed the Continentals in a two-pronged attack. He had a small group of his men march towards Chadd's Ford from nearby Kennett Square, to appear as if they were directly attacking Washington's camp. Meanwhile, the majority of the men crossed at an unprotected ford north of Chadd's Ford and, aided by heavy fog and the hilly terrain, ambushed the Americans. Washington and his men were forced to retreat into Chester, and Howe's army continued its advance towards Philadelphia. 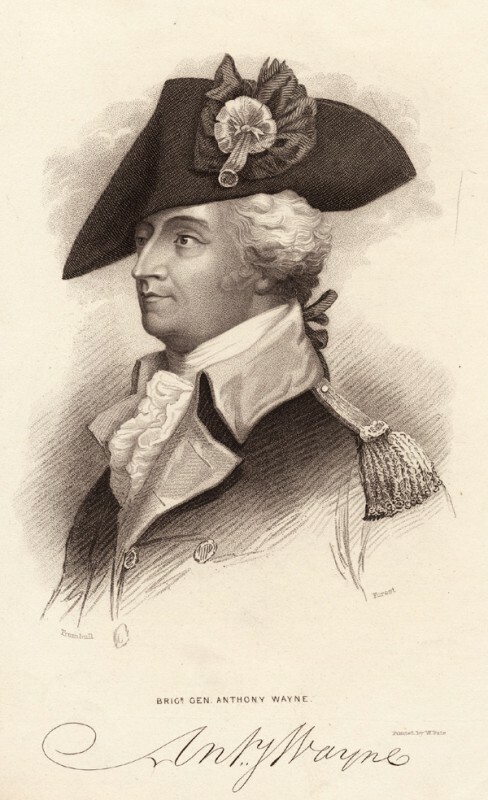 The Continental Army’s Brigadier General “Mad” Anthony Wayne of Chester County was given the job of delaying British General Sir William Howe's advance towards Philadelphia. Wayne’s camp at Paoli was ambushed by the British on September 20, 1777. British Major General Charles Grey ordered his men to remove the flint from their rifles and use only bayonets or swords against the American camp, allowing for a stealthy attack under cover of darkness. Surprised by the ambush, which became known as the Paoli Massacre, Wayne's camp suffered 53 casualties and lost 71 soldiers as prisoners of war. Wayne was vilified and accused of misconduct for succumbing to the ambush, but was later found to have committed no crime and was redeemed. In 1779, Wayne used the same silent bayonet-only strategy to successfully ambush a British camp at Stony Point, New York, and was awarded a Medal of Honor by the Continental Congress. Located at Red Bank on the New Jersey side of the Delaware River, Fort Mercer had been constructed in the spring of 1777. Named for the fallen hero of Princeton, General Hugh Mercer (1726-77), the fort was a sprawling, earthen structure over 300 yards long. Situated on a high bluff overlooking the river, Fort Mercer provided a strategic defensive location just 400 yards north of the home of the Whitalls, a prosperous Quaker family. The Whitalls refused to sell their property to the Americans, who quickly seized their fruit trees to construct Fort Mercer. Recognizing the pivotal role Fort Mercer would play in the campaign, French engineer Thomas-Antoine de Mauduit du Plessis (1753-91) worked with the Americans to reconfigure the fort to make it far more defensible by cutting the size of the fort by roughly one-third. On October 22, 1777, Hessian forces under the leadership of Colonel Carl von Donop (1732-77) left Haddonfield, New Jersey, with orders to take Fort Mercer. Von Donop, defeated at Trenton by Washington’s forces, eagerly seized the opportunity to avenge his name. He commanded a Hessian force of approximately 1,200 men who arrived at Red Bank late in the afternoon. Mercer’s high walls as well as a series of sharpened logs known as abatis made the fort extremely difficult to scale. Complicating the Hessian assault was the arrival of the Pennsylvania Navy under the leadership of John Hazelwood (1726-1800), who began a series of barrages from the river. Mauduit’s engineering plan sealed the Hessians’ fate. Unable to scale the walls and without artillery pieces to breach the fort, the Hessians suffered heavy losses including the mortally injured von Donop. The Whitalls’ home served as a field hospital to injured Hessian soldiers who filled every room of the house. The Hessian dead were buried in a mass grave just north of the house. 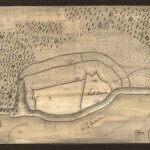 Fort Mifflin, shown here as it appeared in 1777, stood on Mud Island in the Delaware River near its confluence with the Schuylkill. The fort was commissioned in 1771, but completion was delayed until the onset of the American Revolution in 1776. One year later, British troops captured and occupied Philadelphia. Fort Mifflin became the site of a prolonged standoff between a British naval unit under Vice Admiral Lord Richard Howe and an American garrison led by Lieutenant Colonel Samuel Smith. On September 26, 1777, Howe's forces attempted to take Fort Mifflin, which was part of an American blockade preventing the Royal Navy from shipping provisions into the occupied city. The tenacity of the men at Fort Mifflin in holding back the British troops allowed George Washington to move his troops safely to Valley Forge. Despite being reinforced with more men by Washington, Fort Mifflin could not stand up to the heavy bombardment by the Royal Navy that began in November. Smith surrendered on November 15, 1777, the remains of the fort were burned, and the men were evacuated to nearby Fort Mercer in New Jersey. The fall of Fort Mifflin allowed the Royal Navy to supply the occupied city. Fort Mifflin has been restored since it was decommissioned in 1954. Today it is used for educational programs and activities. Mud Island, on which the fort stood, was joined into a larger landmass during the twentieth century as the Philadelphia International Airport was built. 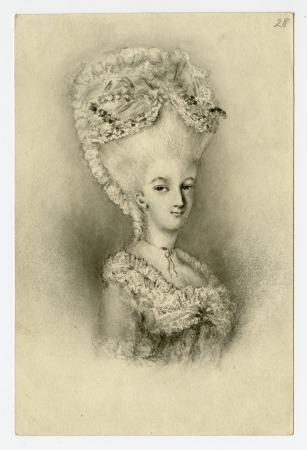 Margaret “Peggy” Shippen, the second wife of infamous traitor Benedict Arnold, was a member of Loyalist society during the Philadelphia campaign. Shippen was raised in a prominent Loyalist household and educated in politics and finance by her father, Judge Edward Shippen IV. During the occupation in 1777, the Shippen family's Society Hill home was frequently visited by British officers. It was through one of these social visits that Shippen was introduced to Captain John André. In May 1778, André planned an extravagant celebration of General Sir William Howe, who was retiring from his post as commander in chief of the British armed forces in America. The celebration was dubbed the Meschianza—Italian for a medley or mixture—and festivities ranged from a jousting match to a regatta. Though there is some modern debate on whether she actually attended, André counted Shippen and her two sisters among the 400 guests. One month after the Meschianza, the British were forced to evacuate Philadelphia. Shippen remained a Loyalist and aided husband Benedict Arnold in his 1779 conspiracy to surrender West Point. She died in 1804. 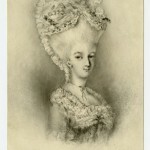 This lithograph, based on a 1777 sketch by André, shows Shippen in a headdress designed for wear at the Meschianza. 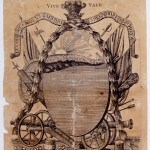 The opulence of the Meschianza can be seen in the tickets that were engraved for the event. Over 400 Loyalist and neutral members of society were invited to the Wharton family's Walnut Grove mansion in what is now Society Hill in tribute to General Sir William Howe, who was resigning as commander in chief of the British Army in America. The event was held on May 18, 1778, and ended with a lavish dinner and ball held in a richly decorated tent. The grandeur of the Meschianza stirred further resentment of the British and Loyalists among the modest Quakers and other dissenters who remained in the occupied city. During the War for Independence, in 1777, the British moved to seize Philadelphia in a series of battles that contributed to a turning point in the war. While the Philadelphia campaign strained British resources and exposed serious leadership issues with General Sir William Howe (1729-1814), the effectiveness of American forces led by General George Washington (1732-99) helped to bring France into the war as an American ally. The summer of 1777 saw the British deeply entrenched in New York City with plans to seize Philadelphia, the revolutionary capital, and destroy Washington’s army. In a stalemate in New Jersey with Washington’s forces, Howe received approval to begin a campaign against Philadelphia as long as his forces remained available to assist an invasion from Canada of General John Burgoyne (1722-92). After receiving permission for his campaign against Philadelphia, in August 1777 Howe sailed up the Chesapeake Bay with a force of 13,000 troops, disembarking at the Head of Elk, Maryland. As Howe began his march to Philadelphia, Washington scrambled to respond. On September 11, 1777, British forces engaged with the Americans at the Brandywine River, an engagement that saw strategic reconnaissance errors by the Americans. Washington hoped to force an attack on the high ground of Chadd’s Ford but a heavy fog provided protection for the British as they moved to outflank the Americans. With Washington’s right flank completely exposed, the American troops could do little more than fight for time as they retreated to Chester. Howe’s men continued toward Philadelphia as the Continental Congress abandoned the city and evacuated to Lancaster and then York, Pennsylvania. The British entered Philadelphia unopposed on September 26. Those with American sympathies had departed the city, leaving a relatively small group of Loyalists and those who were too poor to move. The British immediately set about identifying housing for troops and officers though space remained limited and plundering by British soldiers did not endear them to Philadelphia residents. Howe positioned troops in both Philadelphia and the outlying community of Germantown. Washington, seeing a divided force and hoping to retake the capital, attacked the British at Germantown on October 4, 1777. Washington launched a complicated four-pronged attack but a heavy fog complicated communication. Cliveden, home to the prominent lawyer Benjamin Chew (1722-1810), became the site of intense fighting as entrenched British troops fired heavily upon the advancing American army. Ultimately, confusion and a lack of organization contributed to Washington’s defeat. Nevertheless, the bold attack impressed European observers who began to believe a disciplined army could pose a serious threat to the crown. The American army continued to improve and demonstrate its proficiency on the battlefield. In addition, the dramatic American victory at Saratoga, New York, in October 1777 suggested the patriots could win the war. Howe’s inability or refusal to support Burgoyne’s troops at Saratoga further compromised the crown’s ability to subdue the colonies and encouraged the French to ally with the American cause. As Howe settled into Philadelphia he faced the pressing problem of supplying his troops. Food was scarce and provisions, limited. Washington’s army largely prevented the British from seeking supplies outside the city and the main point of entry into the city–the Delaware River–remained closed through strategic fortifications constructed the previous spring. Fort Billingsport, Fort Mercer, and Fort Mifflin buttressed the Philadelphia and New Jersey sides of the river. A complicated system of weighted spears known as “chevaux de frise” lined the bottom of the river, ready to pierce the hulls of unsuspecting British ships approaching the city. The fort system and chevaux successfully kept Howe from receiving supplies and, with winter looming, Howe recognized action needed to be taken. 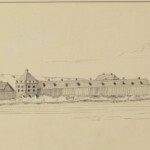 In late October, Howe turned his attention to Fort Mercer, located at Red Bank on the New Jersey side of the Delaware. Situated on a high bluff overlooking the river, Mercer provided a strategic defensive location opposite Fort Mifflin on Mud Island, south of Philadelphia. On October 22, 1777, Hessian forces under the leadership of Colonel Carl von Donop (1732-77) left Haddonfield, New Jersey, with orders to take Fort Mercer. Von Donop, defeated at Trenton by Washington’s forces, eagerly seized the opportunity to avenge his name. He commanded a Hessian force of approximately 1,200 men who arrived at Red Bank late in the afternoon. Mercer’s high walls as well as a series of sharpened logs known as abatis made the fort extremely difficult to scale. Complicating the Hessian assault was the arrival of the Pennsylvania Navy under the leadership of John Hazelwood (1726-1800), who began a series of barrages from the river. Unable to scale the walls and without artillery pieces to breach the fort, many Hessians died and were buried in a mass grave near the fort. The following day either by British design or as the result of enemy fire, the British ships <i>Augusta</i> and <i>Merlin</i> took fire and exploded, an event so loud it was heard miles away. 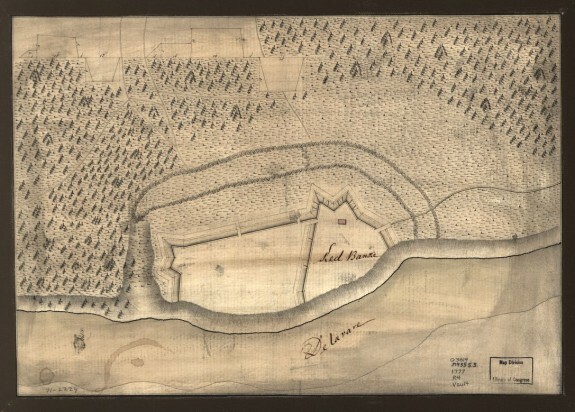 Failing to take Mercer, the British turned their attention to Fort Mifflin, which had been constructed in 1771 under the direction of British officer and engineer Captain John Montresor (1736-99) who, ironically, was now charged with destroying the fort. Lieutenant Colonel Samuel Smith (1752-1839) of the Maryland militia commanded the fort with a force of 200 men. Fort Mifflin saw the heaviest bombardment of the Revolutionary War. Beginning November 10, British forces shelled Mifflin by land and by water, inflicting heavy casualties. By November 15, the fort had been virtually destroyed with few men left to defend it. 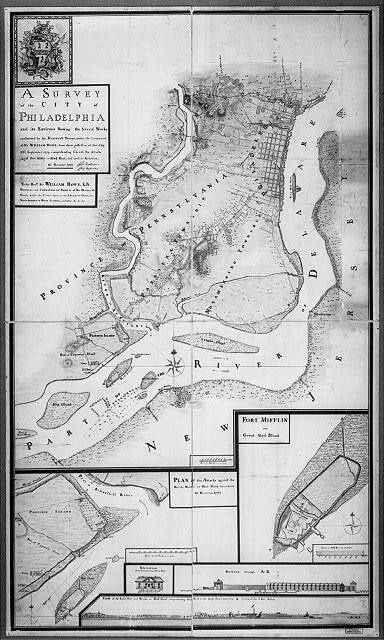 The Americans evacuated the fort and headed across the river to Fort Mercer. Within days of Mifflin’s fall, the Americans abandoned Fort Mercer, restoring British access to the river. The river cleared, Howe’s troops finally received necessary provisions and settled in for winter. With the British now deeply established in Philadelphia, Washington’s forces set up camp for the long winter at Valley Forge. In October 1777, however, Howe had submitted his resignation, complaining he had not received the support he needed to effectively perform his position. The British relieved Howe of his duty in the spring of 1778 and replaced him with General Sir Henry Clinton (1730-95). Howe’s exit from Philadelphia is remembered for the elaborate party known as the “Meschianza,” which included over 400 guests, a 17-gun salute by British warships, and fireworks. 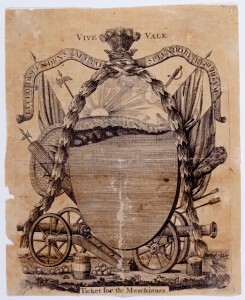 Along with the American victory at Saratoga, the Philadelphia campaign convinced France that the Americans were worthy allies. After the French entered the war on the side of the Americans in February 1778, the British abandoned Philadelphia in June and returned to New York for fear of an imminent French attack. Howe’s missteps in the campaign exposed the weakness in British military leadership and allowed Washington’s troops time to rest, train, and reorganize. Jennifer Lawrence Janofsky, Ph.D., is the Giordano Fellow in Public History at Rowan University and curator of the Whitall House at Red Bank Battlefield. Dorwart, Jeffrey. Fort Mifflin of Philadelphia: An Illustrated History. Philadelphia: Barra Foundation, 1998. Ewald, Johann. Diary of the American War: A Hessian Journal. Trans., ed., Joseph Tustin. New Haven: Yale University Press, 1979. Jackson, John. The Pennsylvania Navy,1775-1781: The Defense of the Delaware. New Brunswick, N.J.; Rutgers University Press, 1974. Martin, David. The Philadelphia Campaign: June 1777-July 1778. Boston: DeCapo Press, 2003. Martin, Joseph Plumb. Memoir of a Revolutionary Soldier: The Narrative of Joseph Plumb Martin. New York: Dover Books, 2006. McGuire, Thomas. The Philadelphia Campaign: Brandywine and the Fall of Philadelphia. Mechanicsburg, Pa. Stackpole Books, 2006. McGuire, Thomas. The Philadelphia Campaign: Germantown and the Roads to Valley Forge. Mechanicsburg, Pa:: Stackpole Books, 2007. Taaffe, Stephen R. The Philadelphia Campaign, 1777-1778. Lawrence: University Press of Kansas, 2003. Gloucester County Historical Society, 17 Hunter Street, Woodbury, New Jersey. The David Library of the American Revolution, 1201 River Road, Washington Crossing, Pennsylvania. Red Bank Battlefield, 100 Hessian Avenue, National Park, N.J.
Brandywine Battlefield, 1491 Baltimore Pike, Chadds Ford, Pa.